Install .NET Framework 3.5 Features on Windows Server 2012 R2 (Offline). Install .NET Framework 3.5 Features on Windows Server 2012 R2 (Online). The .Net Framework 3.5 is not installed on your server. So that we tried to add a new feature from Server Manager. We followed the wizard until we got the Features section then we checked the .NET Framework 3.5 Features then we clicked on Install button. Again, we tried to specify an alternative source path as shown below. Then we specified the source path to .NET Framework 3.5 offline package > OK > Install. But unfortunately, we still can't enable the .Net 3.5 Framework feature!! In Windows Server 2012 R2, the .NET Framework 3.5 feature is an on-demand feature that its files are not saved on the server during the Windows installation due to decreasing the disk space taken by the Operating System. So The feature Installation failed because the source files could not be found! The same Windows media that was used when the Windows is being installed. The Windows media with the same current installed version. Eg. If Windows server 2012 R2 has been installed on your machine you must use installation media for Windows Server 2012 R2. Note: If you don't have the same Windows installation media. you can download the corresponding Windows ISO for your current installed Windows from Microsoft as a trial version. 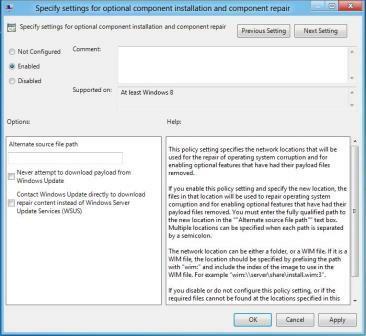 Mount the Windows installation media (ISO/CD) with the same version of the current installed windows. Note: U:\ is the drive that Windows Server 2012 ISO has mounted. Click Install > wait a moment till the feature installed successfully. Deployment Image Servicing and Management (DISM) is a command-line tool that is used to mount and service Windows images before deployment. for more details check DISM - Deployment Image Servicing and Management. d:\ is the drive that the Windows Server ISO has mounted. /All to enable all parent features of the specified feature. /LimitAccess to prevent DISM from contacting Windows Update/WSUS. /Source to specify the location of the files that are needed to restore the feature. 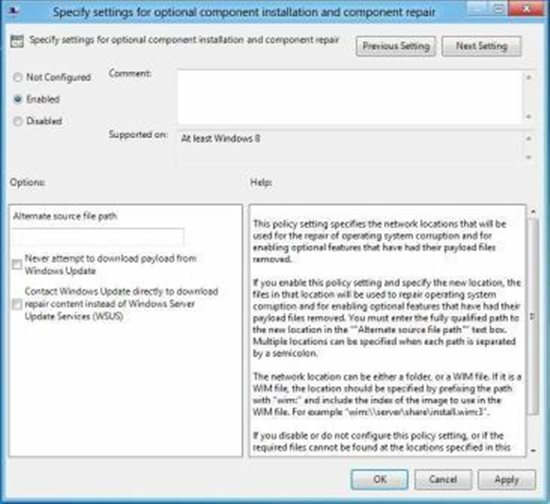 The Group Policy setting Specify settings for optional component installation and component repair is located at Computer Configuration\Administrative Templates\System in Group Policy Editor. repeat step with alter path it will work. In this article, we have explained How to install .NET Framework 3.5 feature on Windows Server 2012 (Online/Offline). Install .NET Framework 3.5 on Windows Server 2012 R2. DISM - Deployment Image Servicing and Management. Enable or Disable Windows Features Using DISM.